CATBALOGAN, Samar – A joint undertaking to address criminality, terrorism, lawlessness, emergencies and disasters has been concretized through the formal signing of a Memorandum of Agreement between the 19th Infantry Battalion Command and the PNP Office Directors of Leyte, Southern Leyte, Ormoc and Tacloban City. This was learned from Lt. Col. Federico Tutaan, the Commanding Officer of the 19th IB in a brief meeting yesterday. Tutaan shared the information immediately after the formal signing of the said MOA with PSSupt. Wilson C. Caubat, the PNP City District Director. The forging of efforts between the two agencies was held at the City Mayor’s Office with no less than Mayor Alfred S. Romualdez witnessing the occasion. It was also attended by 1Lt. Donato A. Molina, 2Lt Ricalyn Paula L. Corleto, PSI Amancio T. Longjas, PSI Francisco T. Calumba Jr. and PSI Leo D. Laraga, OIC of the Tacloban City Police Office. “We’re still scheduling the dates for the MOA signing in two more provinces namely, Biliran and Maasin Leyte”, Tutaan explains while stressing that the six areas mentioned are under his command of responsibility. The creation of the JPSCC was made after assessing a very successful implementation of the same partnership during the May 10, 2010 election where JSCCs were activated. It has allowed for a smooth integration of security operations between the AFP and the PNP. Furthermore, in January 2009, the Office of the President issued Executive Order No. 733 which empowered the Peace and Order Councils in the national and local levels. The said order provides specific Internal Security Operations (ISO) duties and functions to promote convergence efforts intended to improve peace and order as well as public safety in their respective areas of responsibility. In addition, a Centcom-DIPO-Vis Joint Implan (Implementation Plan) dated Dec. 23, 2010 furthermore served as the legal basis for the creation of Visayas JPSCCs. “The JPSCC is a concrete proof for the successful conduct of an integrated approach for any peace and security concerns. We will be working hand in hand with the Local Government Units in the preservation of peace and order and in addressing peace and security concerns occurring in my area. This will allow the local folks to live in a secured environment conducive to development”, adds Col. Tutaan. The JPSCCs shall craft and implement plans for intensified security operations against lawless and criminal elements, private armed and other threat groups in support of the LGUs; assume functions during elections; monitor and assess peace and security situations; coordinate the implementation of necessary measures to ensure peace and security in their area of responsibility; conduct intensified law-enforcement; initiate and coordinate trainings and exercises; conduct information dissemination of timely and relevant information and enhance awareness program. Under the Joint Implementatin Plan, the 19th IB headed by Lt. Col. Federico Tutaan will maintain its role as the lead agency in ISO while the Tacloban PNP will be in active support. On the other hand, the Tacloban PNP will be the lead agency in anti-criminality and law-enforcement functions with the support of the 19th IB. The 19th IB Commander is glad with this development as he considers cooperation and coordination with other law-enforcement agencies as a vital move towards achieving their targets. He believes in the importance of collaboration and consultation with stakeholders. He vows to ensure the protection of human rights as guiding principles in the pursuit of these efforts. In a related story, a Regional MOA between the AFP and PNP has already been signed last January 25, 2011 at the Governor’s Hall, Leyte Provincial Capitol, Tacloban City. The Joint Implan was signed by MGen. 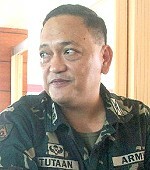 Mario F. Chan, 8ID Army Commander, PRO8 Regional Director PCSupt. Arnold Revilla, and PRO7 Regional Director PCSupt. Ager P. Ontog Jr. Governor Jericho L. Petilla was represented by Vice-Governor Bagulaya. BORONGAN, Eastern Samar – While partner agencies thought it was all well with the deployment of the Registered Nurses for Health Enhancement And Local Services (RN HEALS), they find out about the last minute jitters of some nurses. Department of Labor and Employment (DOLE) Eastern Samar head Alexi Abellar lamented that some nurses assigned to the islands of Guiuan town, like Homonhon and Manicani have not yet reported to their area. Abellar urged them just to inform DOLE if they had a change of heart as there are nurses placed on a wait list and can be tapped anytime. “All they have to do is tell us immediately,” Abellar appealed over Radyon ng Bayan DYES Borongan on February 17, 2011. “The longer they hold back on their decision, the longer we will deprive our people with needed services,” he added. Abellar clarified that these nurses have been asked if they were willing to be assigned anywhere in Eastern Samar and work overtime when they applied online and during the interview. To this, the nurses repeatedly answered, yes. Abellar said he is not privy to their reasons, but whatever these are, these nurses should be honest to admit, by this time, whether they are willing to do the job or not. “We are not necessarily short of applicants,” said Abellar. Abellar also expressed satisfaction that in the northern part of the province, even in remote areas like Maslog, Arteche and Jipapad, all nurses have reported and have started their health services immediately; according to the feedback the DOLE has received. Presently, DOLE and partners Department of Health (DOH) and Department of Social Welfare and Development promised to address the problem so that the nurses can deliver the health services to the barangays as promised. MAASIN CITY, Southern Leyte – A Memorandum of Agreement between the Department of Education and the province of Southern Leyte was approved by the Sangguniang Panlalawigan, Board Member Atty. Teopisto Rojas disclosed in a meeting held at the DepEd Conference Hall here. Through SP Resolution No. 063-s. 2011, SP member Rojas said that the agreement was relative to the counter-parting program for the costing of the construction of public elementary and secondary school buildings throughout the province. “The provincial government will provide the 50% of the cost of the project, while DepEd will allocate the remaining 50%,” Rojas bared, Monday. The local government through the leadership of Gov. Damian G. Mercado has agreed to collaborate and assist the national government in the formulation and implementation of the programs affecting local government units, particularly in addressing the classroom shortage of public elementary and secondary schools in the province. And in order to effectively address the said problem, the provincial government voluntarily agreed to participate in a nationwide cooperative endeavor called as the “counter-parting” program (CPP) where the province of Southern Leyte shares with the national government the cost of the construction of at least two-room school buildings, Rojas revealed. Rojas further said that the DepEd District Supervisors can recommend the area where the school building be built and “to identify what areas need most school buildings,” while urging the Head Teachers to submit project proposals to the SP Office so that proper preparations be made. Atty. Rojas, the Committee Chairman on Education was one of the guest speakers during the orientation of the Enhanced K+12 basic education program initiated by DepEd. LAGUNA, Philippines – Farmer-scientist network MASIPAG (Magsasaka at Siyentipiko para sa Pag-Unlad ng Agrikultura) commends Barangay Panasugan officials in passing a resolution objecting the planting of Bt talong at the Visayas State University (VSU). VSU campus is located in Barangay Panasugan and the university falls under its jurisdiction. VSU is one of the multi-location sites selected for the open field testing of genetically modified talong. According to the resolution penned last January 22, 2011, “the people surrounding the Visayas State University (VSU) campus are concerned about their field testing experiment because the technology has not been thoroughly studied or assessed in the Philippines and this will eventually result in contamination of related plant species growing near the area, among other health, environmental and socio-cultural aspects which are not yet fully understood.” Copies of the resolution will be forwarded to the offices of the VSU president, Mayor and Vice-Mayor of Baybay and the Governor’s office of Leyte. The barangay resolution also pointed out that the barangay council has yet to receive data on ‘pollen flow’ which may contaminate surrounding plants in the area due to cross-pollination and may pose risk to health, and that the area is critical in terms of biodiversity and is a biodiversity ‘hotspot’ in Leyte. It also stated that no public consultation was made, especially to the farmers of the barangay about the intended field trial on Bt talong. Before the year 2010 ended, Clarito Barron of the Bureau of Plant Industry ordered Dr. Desiree Hautea, Project Leader of the Bt talong project based in UPLB to suspend the field tests in UP Mindanao and VSU due to non-compliance on the posting of the Public Information Sheet (PIS) in the Baybay Municipal Hall and the city hall of Davao. Further, two additional resolutions were also passed requesting the offices of Dr. Rosario Salas, Project Leader of the open field trials of Bt talong in VSU and Dr. Hautea of UPLB to provide a copy of the memorandum of understanding between VSU and UPLB about the said project. It also requested details of all research activities and biosafety measures to be undertaken related to the Bt talong project. Clarissa Cruzada, MASIPAG cluster coordinator in Leyte, said they have been closely monitoring the site and the posting of the PIS in the barangay and the municipal offices after reports from a newspaper stated that the field testing would push through according to a university official. The news also stated that PIS were already posted in immediate villages of Panasugan and Guadalupe, but they have yet to see copies of the posted PIS. Bt talong is an eggplant genetically modified to produce a toxin to combat the Fruit and Shoot Borer (FSB). Bt stands for Bacillus thuringiensis, a soil bacteria whose genes are inserted to the eggplant to produce toxins against FSB. Bt talong, which was originally from India, is now being tested in different sites across the Philippines for planned commercialization this year. In India however, the Minister on Environment and Forests Jairam Ramesh order a moratorium on the commercialization of Bt Brinjal (Indian term for eggplant) due to concerns on health, environment and control of agrochem giant Monsanto in their food systems. The Bt brinjal developer Mahyco is a local subsidiary of Monsanto. Last December, Mayor Sara Duterte of Davao City ordered the uprooting of Bt talong at the field test area of UP Mindanao because no public consultation was made. Meanwhile, a congressional forum sponsored by Cong. Teddy Casino was held in January 25 to enlighten the lawmakers on the Bt talong project and its possible effects on health and agriculture. This is in support to the House Resolution 237 directing the House Committee on Agriculture and Food to investigate the said project. QUEZON CITY – Leading proponents of the much clamored reproductive health (RH) bill expressed appreciation for the support of pro-RH lawmakers who despite their different political affiliations, have worked together to pass the consolidated RH bills in the House Committee on Appropriations. According to Ramon San Pascual, Executive Director of the Philippine Legislators’ Committee on Population and Development Foundation, Inc. (PLCPD), the passage of the RH bill in the Committee on Appropriations was received very warmly by groups who rallied this morning in front of the House of Representatives in Batasan, Quezon City. The said rally was organized by the Reproductive Health Advocacy Network (RHAN) to manifest strong, sustained and broad support from various groups for the passage of the RH bill. Gaining 20 pro-RH votes as against the 3 anti-RH votes is a clear indication that the RH bill is supported by the majority of the members of the House of Representatives added San Pascual. The support for RH rally gathered more than 2,000 participants from women, workers and community groups. “P-Noy has nothing to fear because RH enjoys the support not only of the lawmakers but also by the general public, he should take make his clear stand side now,” ended San Pascual. Fr. Dionito Cabillas, secretary general of the Samahan ng Ex-detainees Laban sa Detensyon at Aresto, said almost two decades of military rule under Marcos spawned numerous human rights violations, including summary executions, enforced disappearances, torture, illegal arrests and detention, hamletting and forced evacuation, among others. “Immediately after People Power I, when the Filipino people drove Marcos, his family and military generals out of power, SELDA led the victims of human rights violations in filing a class action suit against the Marcoses in the United States Court. In September 22, 1992, the US Federal Court issued its landmark judgment in favor of the Marcos victims. The said decision has found Marcos guilty of gross human rights violations and the Estate of Marcos is liable to pay damages to the victims. How can a fascist dictator-president, ousted by the Filipino people, be deemed a hero?” Cabillas asserted. Cabillas recalled that this similar proposal came up in 1999, under the Estrada presidency, and was vigorously opposed by the public. “It has been 24 years since the ouster of Marcos, yet the victims during Martial Law have to yet to be fully rendered justice, including indemnification, for the horrific crimes against the Filipino people. This proposal insults the victims and their families and the Filipino people’s struggle against injustices and oppression,” he concluded. TACLOBAN CITY – The Leyte Tourism and Investment Promotion Center (LTIPC) is set to go on a selling mission to various companies in Manila geared for more investment opportunities and employment for the province of Leyte. Targeted industrial firms to be visited are major companies in Metro Manila that represent areas of hospitals, hotels, IT, pharmaceuticals, agri-aqua business and food services. Set this week from February 16-18, the selling mission is set to promote Leyte as an investment destination and to boost the province of Leyte's image in investment, increase inflows and encourage expansion of investments. This as investment generation is seen to result to employment opportunities. Also, as earlier disclosed by Governor Carlos Jericho Petilla, one of the major concerns of the provincial government is the employment of graduates from the different colleges and universities in the province. At present, majority of these graduates end up unemployed or are forced to land in odd jobs not related to their academic courses. The root cause of this problem is pointed at the scarcity of employment opportunities in the province and the mismatch of courses offered by local schools and the current needs of present industries. Data from the Department of Education (DepEd) and Commission on Higher Education (Ched) showed that there are three million students who are graduating this year, some 500,000 are college graduates and barely half of the total graduates get jobs immediately after graduation. The apparent reason observed, is that college graduates’ skills do not match with the available job vacancies. The Department of Labor and Employment (DoLE) earlier expressed concern that many of the graduates do not satisfy what the industry needs. The province through the LTIPC is working to establish a tie-up between Leyte schools and industries, particularly on how modern technology requirements of industries can be matched with school curriculum and to collaborate with the schools of Leyte in upgrading the competency and competitiveness of their grading towards the current skills requirements and related career preparation of the leading industries. After the selling mission, LTIPC has likewise set the 5th Industry Forum on March 17 and 18, 2011. Selected graduating students from the different colleges and universities in Leyte, Biliran and Southern Leyte as well as private and government sector representatives will be invited during the two-day forum. TACLOBAN CITY – Seeing the positive effects of the government’s Pantawid Pamilyang Pilipino Program in the province of Leyte, Governor Carlos Jericho Petilla gladly signed a Memorandum of Agreement for the 4Ps expansion which has already served a number indigent families in the province. The signing was done in Malacañang together with Leyte mayors, other governors and DSWD officials. 4Ps is a poverty reduction and social development program that provides conditional cash grants to extremely poor households to improve their health, nutrition and education, particularly of children aged zero to 14. Cash grants, amounting to P1,400 monthly, are released every three months through a Landbank cash card or over-the-counter payment. In the province of Leyte, 4Ps has been expanded from 10 municipalities to 22 municipalities after the MOA was signed Thursday. Gov. Petilla said that boosting the number of 4Ps beneficiaries is part of the agency's efforts in reducing the vulnerabilities of the poor and the disadvantaged sectors. Aside from noting that the conditional cash transfer would greatly help indigent families, Gov. Petilla however encouraged family-beneficiaries to make use of the amount conscientiously after observations made that other family-beneficiaries use the amount for a different purpose. “We advise them to really utilize the fund for what it is intended for as they run the risk of being disqualified to continue in the program,” Gov. Petilla said. The DSWD-8 has earlier lauded the support of the provincial government through Gov. Petilla, for his continuous support or poverty alleviation programs and initiatives of the social welfare and development office. Just this February, about P5.460 million was released to 449 household beneficiaries of 4Ps in San Miguel, Leyte. 4Ps has dual objectives. The first is Social Assistance to provide cash assistance to the poor to alleviate their immediate need or short term poverty alleviation; and Social Development to break the intergenerational poverty cycle through investments in human capital. 4Ps helps to fulfill the country’s commitment to meet the Millennium Development Goals, namely, to Eradicate Extreme Poverty and Hunger; Achieve Universal Primary Education; Promote Gender Equality; Reduce Child Mortality; and Improve Maternal Health.